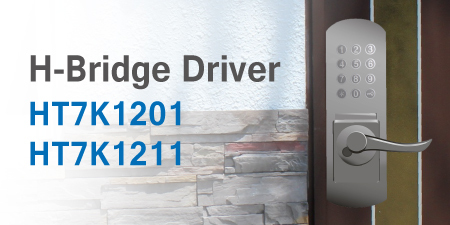 Holtek has released the HT7K1201 and HT7K1211 low-voltage motor drivers, devices which are specifically for use in a wide range of products such as electronic locks, electronic valves, toys, etc. As these highly functionally integrated devices have the feature of low on-resistance power transistor, their efficiency is much improved resulting in reduced device temperature allowing operation over a larger ambient temperature range. Two input control pins provide four modes of operation, Forward, Reverse, Brake and Standby/Sleep. The PWM input control frequency can be up to 200kHz making it useful for accurate speed control applications. A full range of protection features, including OCP, OSP and OTP are also provided to prevent device damage even if the motor stalls or experiences a short circuit in critical operating environments. As the automatic sleep mode entry mechanism is controlled using the same two input control pins, no additional shutdown signal is required and in addition an ultra-low sleep mode current of only 0.1μA leads to extended battery lifetimes. The HT7K1211 has the features of separate power supplies for the control circuits and the motor supply as well an isolated motor current sensing pin which allows the system to measure the motor current using an external low value resistor. The devices can be used to drive a maximum 6V and 7.5V motor and permit a peak motor current of 1.3A and 2.1A respectively. With regard to packaging, the HT7K1201 comes in a tiny SOT23-6 type while the HT7K1211 is available in a superior thermally enhanced 8SOP-EP package type.